First Reading: Acts of the Apostles 8:5-8.14-17. We continue to proclaim the growth of the Church through the ministry of the Apostles, on whom the Spirit had been sent; this ministry reveals the meaning of the death and resurrection of the Lord: that all might be saved This reading can be very powerful: it begins in an almost businesslike way, relating Philip’s message and the welcome he receives. But at the end of the first paragraph comes a very important line: ‘As a result there was great rejoicing in that town.’ How often do we ‘rejoice greatly’ that we have received the message of Jesus Christ? Read this in such a way that we all think for a moment about our own ‘rejoicing’ at the message. The second paragraph will turn our thoughts immediately to the coming feast of Pentecost, and the sacrament of Confirmation, which seals the gift of baptism in the name of the Lord Jesus. Read this simply and carefully, so that people’s minds and hearts can be led by that same Spirit. This reading answers a question: “How should we Christians explain our way of life?” This question is expressed in the first sentence (be careful with the awkward phrasing): “...always have your answer ready / for people who ask you / the reason for the hope that you all have.” This letter was written in a context not of friendly questions, but of threatening inquisitions by the Jewish authorities and the authorities of the Roman Empire - which sometimes led to persecution. This is why Peter makes such a point of the possibility of suffering ‘for doing right’. If we are attacked, then we are like Christ, and we remember that his death opened the way to our life. The last line is a simple link between the two great feasts of Easter and Pentecost: ‘In the body he was put to death, in the spirit he was raised to life.’ We do not face such persecutions today, but attacks on our faith still exist, in more subtle ways - such as indifference or ridicule. 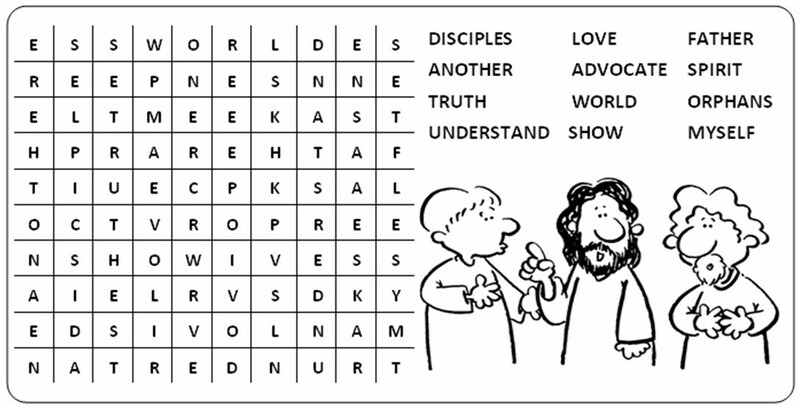 So we can take Peter’s message to heart as we learn what it is to be part of the Body of Christ this Sunday. "No one can say 'Jesus is Lord' except by the Holy Spirit." Every time we begin to pray to Jesus it is the Holy Spirit who draws us on the way of prayer by his prevenient grace. Since he teaches us to pray by recalling Christ, how could we not pray to the Spirit too? That is why the Church invites us to call upon the Holy Spirit every day, especially at the beginning and the end of every important action. "If the Spirit should not be worshipped, how can he divinize me through Baptism? If he should be worshipped, should he not be the object of adoration?" The traditional form of petition to the Holy Spirit is to invoke the Father through Christ our Lord to give us the Consoler Spirit. Jesus insists on this petition to be made in his name at the very moment when he promises the gift of the Spirit of Truth. But the simplest and most direct prayer is also traditional, "Come, Holy Spirit," and every liturgical tradition has developed it in antiphons and hymns. "Come, Holy Spirit, fill the hearts of your faithful and enkindle in them the fire of your love." "Heavenly King, Consoler Spirit, Spirit of Truth, present everywhere and filling all things, treasure of all good and source of all life, come dwell in us, cleanse and save us, you who are All Good." The Holy Spirit, whose anointing permeates our whole being, is the interior Master of Christian prayer. He is the artisan of the living tradition of prayer. To be sure, there are as many paths of prayer as there are persons who pray, but it is the same Spirit acting in all and with all. It is in the communion of the Holy Spirit that Christian prayer is prayer in the Church.